There is no telling what might be found inside a fencepost. 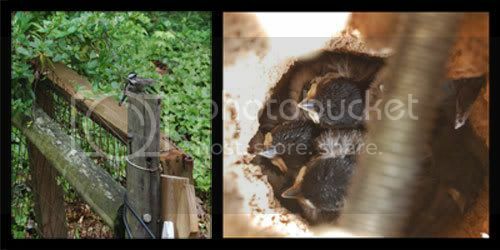 The pictures above are of a family of chickadees that decided to make a nest in a hollow part of the fencepost. Taking the picture of the baby birds was the fun part. How was I going to light the tiny and very dark inside of a fencepost (notice the tip of the nail on the right side of the picture)? I had to use the hole in the side of the post, where a bolt once was, to light the baby chickadees. This is the second set of baby birds that I have seen this year. The others were house finches that built a nest on our wreath hanging on the front. This year is the first time that I have had the opportunity to see babies bird in their nest. Maybe until now I was just too busy to notice. It’s nice to slow down and see all the amazing thing that God has made around us.